We’ll provide some insights and review some of our DFS value players for week 15. Josh Allen (BUF) – Salaries: DraftKings (DK) – 5800, FanDuel (FD) – 7600. Allen’s upcoming salary ranks him 16th/16th on DK/FD, respectively for the position. Allen posted an 18/36, 206, 0:2 passing line and 9-101-1 with a lost fumble on the ground against the Jets last week. Allen’s 24.34/20.34 fantasy points ranked him 6th/8th on DK/FD, respectively. Allen’s price per point efficiency ranked him 7th/8th on DK/FD, respectively. The betting line with the Lions (5-8) lists the game total at 38.5 points (2nd lowest on the board) with the Bills (4-9) as -2.5 point home favorites. The Bills’ implied team total is currently at 20.5 points and the Lions are currently at 18 points. The Lions’ defense ranks 19th against QBs in fantasy points allowed, 31st in DVOA against the pass, and 20th in DVOA against the run. The Lions have been very stingy against QBs on the ground however, as they have not allowed a QB to exceed 18 rushing yards this season. This list includes the likes of Mitchell Trubisky, Cam Newton, Russell Wilson, and Dak Prescott. Allen’s 490 rushing yards ranks him 1st for QBs, despite missing four games due to injury (elbow). The past three games since returning from the bye and a four-game absence, Allen has averaged 28.13 DK points, finishing as a top 8 QB during this span. Allen averaged 111.7 rush yards/gm during this span as well. As the vast majority of his rush yards comes from scrambles as opposed to designed calls, he is difficult to defend. Allen’s red zone QB rush yards (89) ranks him 1st and his QB red zone rush TDs (5) also ranks him 1st (tied). As home favorites, Allen’s projected game flow should suit his strengths. Weather doesn’t project as an issue for the Bills with anticipated sub 40 degree temperatures. 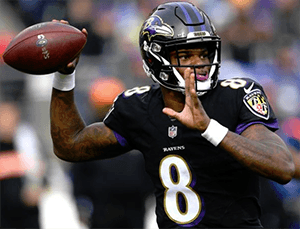 Lamar Jackson (BAL) – Salaries: DraftKings (DK) – 5900, FanDuel (FD) – 7700. Jackson’s upcoming salary ranks him 13th/15th on DK/FD, respectively for the position. Jackson posted a 13/24, 147, 2:0 passing line and 13-71-0 with a lost fumble on the ground at Kansas City last week. Jackson’s fantasy points of 19.98/18.98 ranked him 13th/14th on DK/FD, respectively for the position. Jackson’s price per point efficiency ranked him 12th/12th on DK/FD, respectively. The betting line with the Bucs (5-8) lists the game total at 46.5 points with the Ravens (7-6) as -8 point home favorites. The Ravens’ implied team total is currently at 27.25 points and the Bucs are currently at 19.25 points. The Ravens are a half game behind current division leader Pittsburgh. The Bucs’ defense give up the 5th most fantasy points allowed to QBs, also ranking 30th in DVOA against the run, and 28th in DVOA against the pass. The Bucs rank 27th in total yards allowed with 387.9/gm, and the 30th in points allowed with 29.5/gm. Drew Brees posted a 24/31, 201, 1:1 passing line with a lost fumble at Tampa Bay last week. Jackson’s 475 rushing yards ranks him 2nd for QBs. Jackson averaged 19.9 DK points over his past four games. Jackson averaged 84 rush yards/gm and 16.8 rush attempts during this span as well. Unlike the case with Josh Allen, the vast majority of Jackson’s rush yards comes from designed calls. Jackson’s red zone QB rush yards (81) ranks him 2nd and his QB red zone rush TDs (3) ranks him 5th (tied). The Ravens’ combined backfield posted a 39-198-1 rush line for a 5.1 avg. at Kansas City last week. As was the case last week, the game plan should be again straight-forward. The Ravens will be looking to run down the Bucs’ throats. Joe Flacco (hip) has been cleared but will be Jackson’s backup moving forward. The changing of the guard is now official. As big home favorites, Jackson’s projected game flow should bode well for him this week. The weather in Baltimore currently projects for occasional showers and slight wind. The Ravens’ defense would make for a solid stacking option with Jackson if paying up. Jaylen Samuels (PIT) – Salaries: DraftKings (DK) – 5200, FanDuel (FD) – 5500. Samuels’ upcoming salary ranks him 24th/37th on DK/FD, respectively for the position. Samuels posted an 11-28-0 rush line and 7-64-0 on 7 targets with 48 snaps (80%) at Oakland last week. Samuels’ fantasy points of 16.2/12.7 ranked him 14th/20th on DK/FD, respectively. The betting line with the Patriots (9-4) has the game total at 52 points (3rd highest on the board) with the Steelers (7-5-1) as +2 point home dogs. The Steelers’ implied team total is currently at 25 points and the Patriots are currently at 27 points. The Patriots’ defense ranks 17th against RBs in fantasy points allowed, 21st in DVOA against the run, and 20th in DVOA against RBs in the pass. The Steelers’ O-line ranks 15th in adjusted line yards while the Patriots’ D-line ranks 23rd. Miami RBs combined for a 20-176-2 rush line and 3-79-1 on 3 targets against New England last week. Samuels out-snapped Stevan Ridley 48 to 8 and out-touched him 19 to 5. They each got a goal-line carry but Ridley banged his in. Samuels’ targets, catches, and receiving yards ranked him 2nd on the team behind JuJu Smith-Schuster last week. This game has shootout potential, which should keep Samuels potentially involved throughout. James Conner (ankle) missed Wednesday’s practice. His status for this week is currently unknown but it would be somewhat surprising if he were to go at this point. If he does get the start, that certainly changes things. Other than slight morning showers, weather does not currently project to be an issue in Pittsburgh. Joe Mixon (CIN) – Salaries: DraftKings (DK) – 6100, FanDuel (FD) – 7800. Mixon’s upcoming salary ranks him 16th/9th on DK/FD, respectively. Mixon posted a 26-111-1 rush line and 5-27-0 on 6 targets with 47 snaps (70%) at Los Angeles Chargers last week. Mixon’s fantasy points of 27.8/22.3 ranked him 5th/5th on DK/FD, respectively for the position. Mixon’s price per point efficiency ranked him 7th/5th on DK/FD, respectively. The betting line with the Raiders (3-10) has the game total at 46 points with the Bengals (5-8) as -3 point home favorites. The Bengals’ implied team total is currently at 24.5 points and the Raiders are currently at 21.5 points. The Raiders’ defense ranks 22nd against RBs in fantasy points allowed and 27th in DVOA against the run. The Raiders also rank 31st in rush yards allowed with 144.5/gm and 31st in points allowed with 29.8/gm. The Bengals’ O-line ranks 18th in adjusted line yards while the Raiders’ D-line ranks 27th. Mixon out-snapped Gio Bernard 47 to 25 and out-touched him 31 to 5 last week. For whatever reason, Mixon tends to get scripted out of games when the game flow goes negative. That should not be the case this week as home favorites. The weather in Cincinnati does not currently project to be an issue. Dante Pettis (SF) – Salaries: DraftKings (DK) – 4400, FanDuel (FD) – 5500. Pettis’ upcoming salary ranks him 40th/43rd on DK/FD, respectively for the position. Pettis posted a 3-49-1 receiving line on 7 targets, with 61 snaps (85%) against the Broncos last week. Pettis’ fantasy points of 13.9/12.4 ranked him 24th/22nd on DK/FD, respectively for the position. The betting line with the Seahawks (8-5) the lists the game total at 44 points with the 49ers (3-10) as +4.5 point home dogs. The 49ers’ implied team total is currently at 19.75 points and the Seahawks are currently at 24.25 points. The Seahawks’ defense ranks 18th against WRs in fantasy points allowed and 13th in DVOA against the pass. The Vikings’ WRs combined for a 12-162-0 receiving line on 17 targets at Seattle last week. Pettis averaged 7 targets, 5 catches, and 1.33 TDs over his past three games. Pettis’ routes run (41) where 12 more than the next highest WR. When last these teams met in week 13 in Seattle, Pettis lit them up for a 5-129-2 receiving line on 7 targets, good for 32.7 DK points. Pettis will get an implied negative script at home, and he’ll have Marquise Goodwin this time to help clear space. Isaiah McKenzie (BUF) – Salaries: DraftKings (DK) – 3900, FanDuel (FD) – 5100. McKenzie’s upcoming salary ranks him 63rd/65th on DK/FD, respectively for the position. McKenzie posted a 4-47-0 receiving line on 7 targets and 4-22-1 on the ground with 59 snaps (78%) against the Jets last week. McKenzie’s fantasy points of 16.9/14.9 ranked him 18th/16th on DK/FD, respectively for the position. Jones’ price per point efficiency ranked him 9th/7th on DK/FD, respectively. The Lions’ defense ranks 19th against WRs in fantasy points allowed and 20th in DVOA against the pass. The Cardinals’ WRs combined for a 15-197-0 line on 25 targets against the Lions last week. McKenzie plays the slot, which will keep him away from Darius Slay. McKenzie has two rushing TDs in his past three games, and has at least two attempts in 3 of his last 4 games, giving him a designed rush floor. If punting the position around this price point, you could probably do worse. Blake Jarwin (DAL) – Salaries: DraftKings (DK) – 2700, FanDuel (FD) – 4700. Jarwin’s upcoming salary ranks him 26th/29th on DK/FD, respectively for the position. Jarwin posted a 7-56-0 line on 7 targets with 58 snaps (59%) against the Eagles last week. Jarwin’s fantasy points of 12.6/9.1 ranked him 10th/12th on DK/FD, respectively for the position. Jones’ price per point efficiency ranked him 6th/9th on DK/FD, respectively. The betting line with Colts (7-6) the lists the game total at 47 points with the Cowboys (8*5) as +3 point road dogs. The Cowboys’ implied team total is currently at 22 points and the Colts are currently at 25 points. The Browns’ defense ranks 21st against TEs in fantasy points allowed and 23rd in DVOA against TEs. Houston TEs combined for a solid 11-151-0 line on 11 targets against the Colts last week. Jarwin’s receiving targets, catches, and yards last week were all season highs. With defensive attention more focused on Amari Cooper and Zeke Elliott, Jarwin could provide Dak Prescott a sneaky option in a great matchup. C.J. 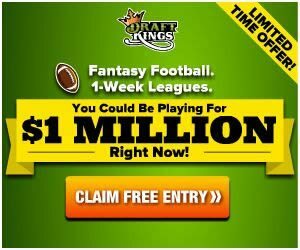 Uzomah (CIN) – Salaries: DraftKings (DK) – 3600, FanDuel (FD) – 5000. Uzomah’s upcoming salary ranks him 14th/22nd on DK/FD, respectively for the position. Uzomah posted a 3-37-0 line on 3 targets and 58 snaps (87%) against the Chargers last week. The Raiders’ defense ranks last against TEs in fantasy points allowed and last in DVOA against TEs. Pittsburgh TEs combined for a 6-65-0 line on 6 targets at Oakland last week. Uzomah is the Bengals only TE so he will get all the positional action in the best possible matchup. He’ll need to fall into the end zone to make owners happy as he doesn’t draw a lot of targets, but at least that has happened a couple of times this season.